In the Understanding the PT-INR Test section of ClotCare, I mention that the traditional way to run a PT-INR test is to have your blood drawn and sent to a lab, where the test is conducted. With this process a certified professional inserts a needle into your arm and draws a full tube of blood. Then, the blood is sent to a laboratory for analysis, and usually the lab is offsite. In most cases, the lab faxes the INR result to the anticoagulation provider within about 24 hours. Another option for obtaining an INR is to use a point-of-care device, also known as a fingerstick testing device. To use this device, you insert a test strip into the device, prick your finger and apply a drop of blood to the test strip. The device then reports the INR within a minute or so. The entire process is usually very quick. Point-of-care devices are portable and typically are easy to use and report accurate results. In fact, some studies have shown that INR results from point-of-care devices are more reliable than results from a traditional lab.1 Additionally, if an INR result is surprising, another test can be run immediately to either confirm or refute the result. Jack Ansell, MD recently presented a webinar discussion on one such study. Click here to view this webinar. If you are interested in self-testing, then a good starting point is to discuss the issue with your anticoagulation clinician. Most patients on warfarin are capable of doing self testing, and many others may be able to test at home with the help of a caregiver. Even so, not every patient on warfarin is a good candidate for self testing. If you are a good candidate for self testing, and your clinician likes the idea, then there are a few things you should know. First, you need a prescription from your physician to do home testing. Second, self testing can be expensive if you are paying out of pocket. The good news is that many insurance plans will help cover the cost of self testing. Additionally, the companies that provide the devices and test strips (IDTFs) often can help you get your insurance to cover the costs. Medicare covers the cost of self testing for patients taking warfarin due to a mechanical heart valve or atrial fibrillation. Medicare has several specific requirements for self testing patients, and Medicare policies change over time, so if you are interested in self testing, you will need to discuss current coverage requirements with your physician and/or the company helping you to obtain a device. If after discussing the issue with your physician, you decide that you would like to become a home-tester, then a good next step is to contact an IDTF (Independent Diagnostic Testing Facility). An IDTF can provide you with testing materials and will help you to complete all the necessary paperwork. Most IDTFs also will work with your insurance company to get the cost of your supplies covered. If your insurance will not cover the cost of your self testing supplies, many IDTFs may be willing to work out a payment plan or leasing option. Below we have provided some links to websites that you may find useful if you wish to become a self tester. 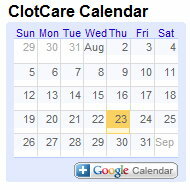 Please note that ClotCare is in no way affiliated with any of the sites to which we provide links, nor do we endorse these companies. Further, we recognize that this list is not a complete list of all useful websites on this issue. We provide these links because they are the sites of which we are aware and because we feel that they may be useful to you. Bussey HI, Chiquette E, Bianco TM, et al. A statistical and clinical evaluation of fingerstick and routine laboratory prothrombin time measurements. Pharmacotherapy 1997; 17:861-66. Bloomfield HE, Krause A, Greer N, et al. Meta-analysis: Effect of patient self-testing and self-management of long-term anticoagulation on major clinical outcomes. Ann Intern Med. 2011; 154:472-482. Bussey HI and Bussey M. Warfarin Management; International Normalized Ratio Self-Testing and Warfarin Self-Dosing. Circulation. 2012; 126:e52-e54.